AUSTIN, Texas (AP) — A Southern California-Texas rematch was supposed to be an early-season blockbuster. With both programs struggling, it feels more like a fight for survival, and the pressure is mounting to find a win to keep their seasons from spinning off course. The No. 22 Trojans (1-1) and Longhorns (1-1) meet Saturday night with both teams facing questions about their quarterbacks and how nervous fans would react will react to another loss. There’s little question about the talent in the Trojans’ J.T. Daniels, USC‘s first true freshman starting quarterback in a decade. It’s more about how he handles the team in another pressure cooker in front of a loud crowd that will likely approach 100,000. Daniels won his debut against UNLV but the offense struggled badly and managed just a field goal in a loss last week at Stanford. Now he faces a Texas defense that harassed and hurried Sam Darnold for most of four quarters last season before the Trojans won in double overtime. Count Texas defensive coordinator Todd Orlando among those impressed by what he’s seen of Daniels so far. 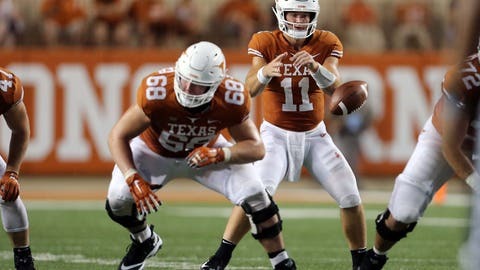 At Texas, the problem has been cleaning up a pattern of mistakes by quarterback Sam Ehlinger — mostly turnovers — that have been costly. Ehlinger’s turnover issues started against USC last season when he had two, including a fumble in the second overtime that doomed the Longhorns in a 27-24 loss, and it would prove to be a season-long problem. He worked to clean up the mistakes in the offseason, then threw two fourth-quarter interceptions in a season-opening loss to Maryland. He had a second-half fumble against Tulsa in a game Texas led 21-0 and held on to win 28-21. Ehlinger had a stellar fourth quarter against Tulsa, directing a time-chewing drive to the Longhorns’ final touchdown. Second-year Texas coach Tom Herman saw a huge victory slip away in overtime in Southern California last season. He’s now 8-7 after 15 games, and Longhorns fans are getting antsy for a big turnaround at a program that hasn’t contended for the Big 12 title since 2013. Another 1-2 start with a team he promised is better than last season could be ugly in Austin. TESTING THE SAFETIES: Injuries and attrition have depleted the USC secondary, most notably at safety. Texas will try to exploit that with deep routes to Collin Johnson, Lil’Jordan Humphrey and speedy Devin Duvernay. Johnson had a career game against USC last season with 191 yards receiving. Humphrey has a 40-yard touchdown this season and Duvernay has a 39-yarder. CHASING DANIELS: A Texas pass rush that was supposed to be a strength is yet to appear. Senior ends Breckyn Hager and Charles Omenihu don’t have a sack or a quarterback hurry in the first two games. If USC can quickly read Texas blitzes and the Longhorns can’t pressure Daniels from the edge, the freshman could have a big night. DANIELS’ HAND: Daniels sat out a series against Stanford after bruising his throwing hand in the first quarter when he hit another player’s helmet. USC coach Clay Helton said all seemed OK by midweek. “I didn’t see any hesitation, didn’t see any wincing,” Helton said. MISSING BIG FOOT: Texas clearly misses the booming, coffin-corner kicks of former punter Michael Dickson, who is now in the NFL. His cousin, Ryan Bujcevski, has struggled a bit as his replacement. The Longhorns defense realizes what a luxury it had last season when teams were often pinned inside their own 10. Texas also gave up a blocked punt last week against Tulsa. FIELD GOALS: USC’s Chase McGrath kicked the game-winning field goal in the second overtime to beat Texas last season. He’s already made six of seven attempts this season, with a long kick of 47 yards, and accounted for the only points against Stanford. Field goals were an adventure for Texas last season and freshman Cameron Dicker hasn’t attempted one yet.